Accessories: (2) 10’ continuous flow ridge vent. Our Vashon Island Washington customer loved cars and needed a place to store and work on them. He approached PermaBilt® knowing we have been building post frame buildings since 1973. His major concern was not the design but rather getting the necessary permits to build his metal garage and workshop. 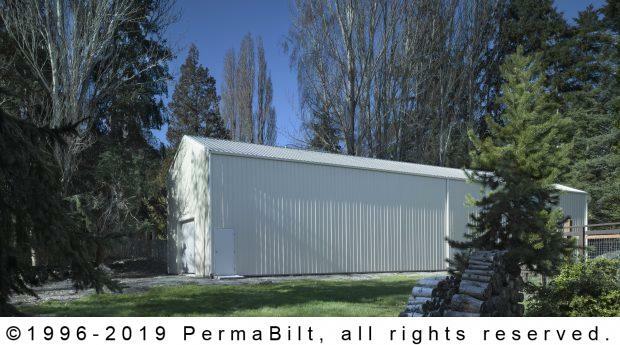 PermaBilt worked through the permitting challenges of his site and was ready to build his big metal garage. His design included a single 10’ x 9’ raised panel steel overhead door and two walk-in doors on each end of his 96 foot long garage. This made sense because due to the length of the building, our customer had access to the outside at either end. Additionally, we added a second floor, engineered for a future loft. So even if he wasn’t interested in using it when the garage was finished, he could build one at a later date. We also added two 10 foot continuous flow ridge vents. With a the length and size of his building, it was important that he had the proper ventilation especially when working on cars. The ridge ventilators provided 12 square inches of vented area per linear foot and with a totally covered top there’s no worry about rain or snow.